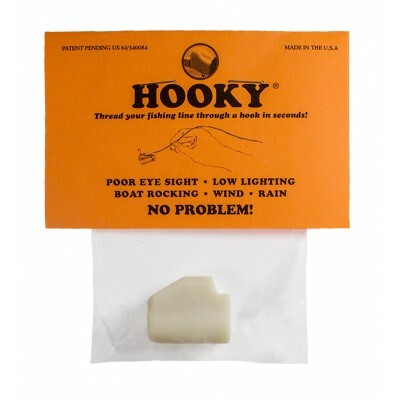 The HOOKY® is a fishing product that snaps on to your fishing rod. You can also attach it to a pen, a dowel or just use it in you hand if you like. Do you lose time during fishing? If you lose time due to poor eye sight, dim light, cold fingers, boat rocking, wind and rain then a HOOKY® can make your time fishing much more enjoyable. HOOKY® is available in three colors - White, Yellow and Orange.